The number of things to consider when preparing for a few hours of pleasant birding can be daunting for someone new to the hobby of birdwatching. And this is even before having to deal with trying to identify what seems like a million birds flying by. But like any brand new endeavor, it’s not nearly as complex as it seems at first glance. Here’s a quick list of the main things that novice birders should consider when heading out their front door. Binoculars are essential to birdwatching as they are the tool we use to bring the birds closer to us. So choosing the right kind of binoculars means the difference between enjoying clear views of the birds or spending your time staring at blurry images, with the added results of strained eyes and big frustrations. 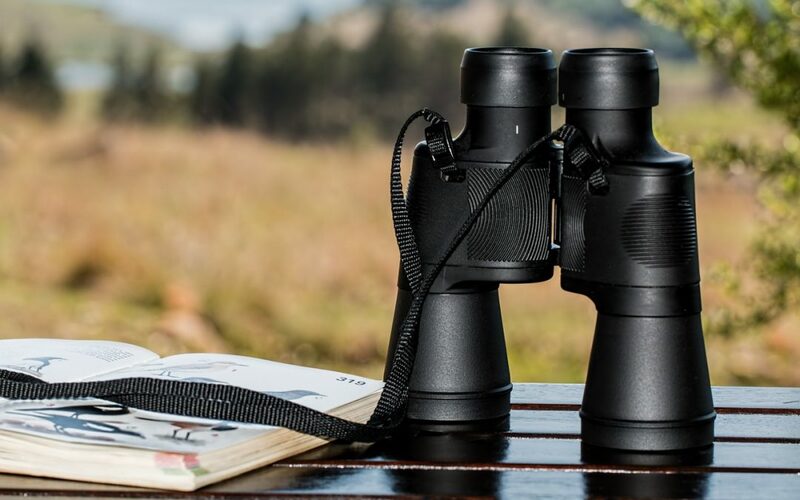 If you are not sure what kind of binoculars you should use, here’s an article about what to consider when buying binoculars. In addition to a collection of muddy, scratched and sometimes broken binoculars, birders also have a tendency to amass large collections of bird guides. And it’s no wonder; a trip to a good bookstore will reveal dozens, if not hundreds, of different bird guides. There are some standard bird field guides, as well as some pretty esoteric guides. For basic bird watching, you can get by with a single book. If you are new to birdwatching, check out this article on field guides for absolute beginners. Birding is something you can do anywhere, even from the comfort of your living room. But the best experiences happen when you are ‘out there’, away from the crowds, cars and strip malls. To maximize the number of birds you will see, try to include a wide variety of habitats in your trip. Habitat edges, where two very different environments meet each other (like lakeshores or forest-field boundaries) are excellent places for wildlife. Time of day is also an important factor, with more birds visible, and heard, during the early morning hours. Generally, the quieter the area, the more birds you are going to encounter. The best time of day for birdwatching (at least during the spring and summer) is during the hours following sunrise. This is when birds are most active, with males singing to avertise their territory and both males and females ativley hunting for food. But early mornings, even in summer, can be quite chilly, as can a sudden rain shower at any time of day. If the weather turns nasty, most forest birds will retreat to a sheltered spot and remain quiet until the weather passes. But if you find yourself walking along a lakeshore or a river, even inclement weather won’t stop waterfowl and shorebirds from carrying on with their day. If you are prepared for bad weather, there is no reason why you can’t continue birdwatching in some areas. Notebooks, especially those with hard covers, are handy for writing descriptive notes or making sketches of birds you don’t recognize. They are also good for keeping track of the birds you see, describing hot spots where the birdwatching is surprisingly good or simply keeping a diary of what transpires during your day. Birdwatchers don’t get up before sunrise just for the pleasure of experiencing sleep deprivation but because the birding really is better in the early morning. This doesn’t mean that birdwatching during the rest of the day won’t be productive; you can find birds at any time, even the middle of the night. However, there is a special feeling which comes from being surrounded by birds at sunrise, and listening to the symphony of bird song while drinking coffee from a battered old thermos. There are literally thousands of birdwatching and nature clubs in North America. Hanging out with experienced birders is perhaps the fastest way to learn about the world of birds. If there is one constant in the Universe, it’s that birdwatchers love to share their experience and talents with new birders. Birdwatchers don’t mind being asked a thousand questions about birds; after all, they were the ones asking the same questions when they first began watching birds. You would be amazed how a single question to a person you just met along the trail can turn into a day-long excursion in the company of someone who has the answers to all of your birding questions. Tune into bird songs. It’s the easiest way to find birds when they are hidden by vegetation or sneaking up behind you. Some bird songs and calls are very subdued so it takes a keen ear to detect them. And small birds who are quietly moving through the underbrush will also be easier to find. It may seem as if you’re not being very productive but moving slowly through an area will allow you to see many birds that you would otherwise miss when walking more quickly. This is especially true with the more secretive and furtive bird species. Find a comfortable spot to site for a while and let the birds come to you. Birds are always moving around and many of them will eventually pass your way. Once you start looking for birds, you will be amazed at how often you actually see them. Birds can be found in every environment, even downtown urban areas. And once your mind, along with your eyes and ears, are attuned to the presence of birds, finding them becomes second nature. Find a natural area near your house and visit it regularly throughout the year and at different times of day. After a while, you will not only become intimately familiar with the resident birds but also with the ebb and flow of migrant birds and breeding species which move through your area. There are literally an infinite number of information sources about birds. Explore a bookstore, bury yourself in the local library, or disappear down the virtual rabbit hole of on-line birding resources. The sheer number of books, magazines, CDs, maps, checklists, equipment, etc., devoted to birds and bird watching is staggering. Almost every birder maintains a life-list, in which they keep track of all the bird species they have ever seen. It’s a good way to map your progress as a birder, especially during the first few years. And with so many regions across North America producing their own bird checklists, it’s easy to start a life-list. But beware, the use of checklists can be very addictive. Many birders start with a single life-list but eventually end up keeping a yard list, town list, state list, county list and summer vacation trip list. Some birders will also keep more esoteric lists, such as a seen-from-the-office window list or heard-in-movies list. The possibilities are endless. Get out there. The more you do it, the more you learn. Learning about birds never stops, no matter how many years you’ve been doing it.